I have long been a “forever in blue jeans” kind of guy. I haven’t always worn blue jeans, but somewhere along the line I started wearing them and have done so for many decades. I did not wear blue jeans during my Claremont cockroach days. I certainly did not have a lot of money for new clothes then. I did not have a lot of money, period. But one of my Claremont friends turned me on to a hole-in-the-wall clothing outlet store where I found a pair of corduroys at a really good price. 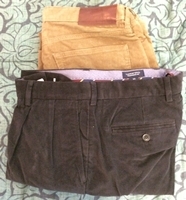 They were my favorite pair of non-work, casual trousers until I wore them absolutely threadbare. That was in the mid-1970’s. I haven’t owned a pair of corduroys since. Until now. I reinstated my Lands End account online to order a pair of slacks for church, since the pair I had been wearing were seriously falling apart. I got an email from them that offered fifty percent off a regularly priced item. And they tantalizingly featured cords in that same email. I ordered one pair half off full price and another heavily discounted, apparently on close out. So now I have two new pair of corduroy. Terry loves them and I am really enjoying my soft, comfortable corduroys for the first time since 1975 or so.